This Adapter Ring from Lee Filters allows the Foundation kit holder to fit the Canon 17mm TS-E lens. It allows more than 50% of the total movement of the tilt-shift lens before vignetting becomes a problem. The adapter ring allows the use of 100mm rectangular filters as well as a 105mm circular polarizer. 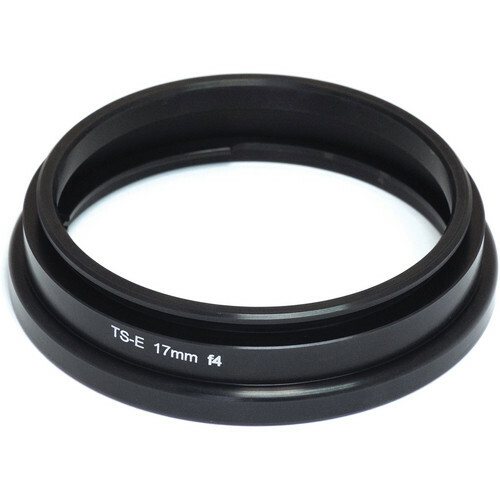 Adapter Ring for Canon 17mm TS-E Lens is rated 4.6 out of 5 by 9. Rated 4 out of 5 by Nightnoise from A good option for the TS-E 17 Consider this adapter for use with the TS-E 17 and the Lee filter system. Like anything their are pluses and minuses. You cannot shift the full amount without vignette but what you can shift will let you get by. You still need to be careful not to damage the front element of the TS-E 17 so that doesn't change. The big plus is that you have the option to use all the 100mm filters from the Lee system and other manufacturers. I bought the Lee white plastic caps for my Lee adapters. The caps will work on this adapter, but once again, watch what you are doing so you don't scratch the lens. So on balance, I think that anyone who already has bought into the Lee or other filter systems should give this a try. Rated 3 out of 5 by Bryan from Might be better off with Wonderpana The adapter ring attaches to the lens cap bayonet mount and is very solidly milled out of what appears to be aluminum, and I have no complaints about that. However, unlike the Canon cap there is no sure locking mechanism (which is not indicated here). There is tension adjustment with some metal tabs inside the adapter but it is still not very firm. Rotating the foundation kit holder will rotate the adapter as well, and can rotate the adapter off the lens. If you're bent on using 100mm filters you might be better off making your own.Lee advertises that you can do more than half of the movement before vignetting sets in, but in reality it only allows for just over 4mm of horizontal shift and 5mm of vertical shift before it vignettes. And practically no shift or tilt with the polarizer.You can't use the big stopper with more than 2mm shift this unless you modify the big stopper and remove most of the foam light seal.If you use the lens with very little shift and only tilt, then you can probably get away with this adapter OK. Otherwise, you're better off with a Wonderpana adapter which is competitively priced. Rated 5 out of 5 by Jimmy from Perfect match, excellent quality This adapter ring is specially designed for the Canon TS-E 17mm lens, and it matches perfectly. Only 1mm gap between the lens front element and the first filter (slot), and I guess that's the closest you can do. However, there will be vignetting when you shift the lens more than about 7mm, but 7mm shift is enough for most of the situation. Overall, this is a well designed ring with high quality. Rated 5 out of 5 by Vill from Works, but with limits Works well with TSE17mm, but know your limits. For the vertical shifts, I found that +/-7.5 markings from level is the absolute limit before you see the black ring come into view. Also, don't use the 105mm circular polariser ring, and likewise the polariser. Otherwise, it will severely limit your shift movements. Rated 5 out of 5 by Anonymous from Fantastic Product! Love being able to put a filter on our TSE17 especially LEE filters. Added a whole new level to our external architectural shooting. There is vignetting but only at the extreme ends of tilting and shifting, but this was to be expected. Rated 5 out of 5 by Charles from It works This adapter ring allows me to use my grad filters with a limited amount of tilt shift. Rated 5 out of 5 by Unravel photo from Great adapter! The ring adapter is truly well make, the materials are tough and fits perfectly. The foundation kit works very well. Truly worth having this ring if you are shooting landscapes with the Canon 17mm TS-E Lens. Very little vignette when shifting. Rated 5 out of 5 by Anonymous from fit great.. the only option no other way to attach filter on TSE17 except this. This adapter is proprietary to the LEE Foundation Kit. Would the Sensei Pro 100 Holder be able to be used with this Lee adapter? Yes, the adapter ring for the Canon 17mm TS-E lens from LEE is designed to be used with the Lee Foundation Kit, which is the 4 filter holder. Hi,I have Canon 17mm TS Lens. I need to buy polariser filter for that. Could you please let me know which size adaptor, holder and filter should i buy?Thanks.